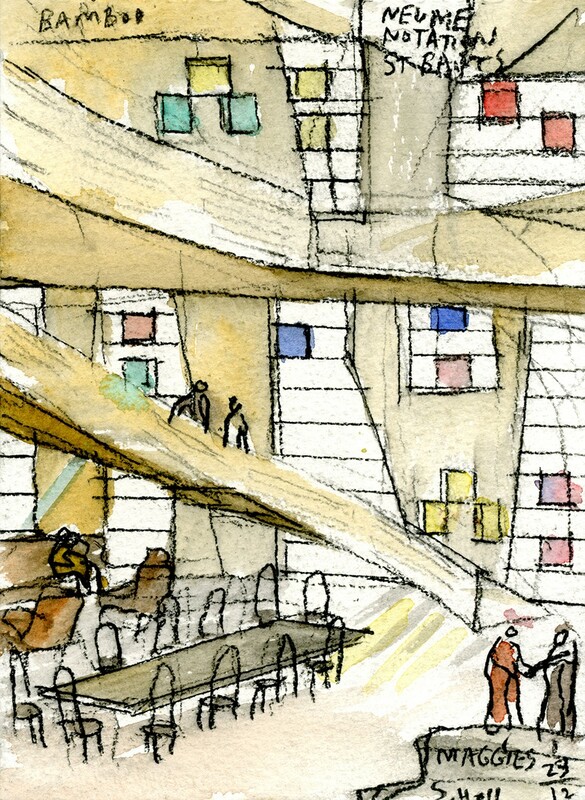 The site in the center of London is adjacent to the large courtyard of St Bartholomew’s Hospital. 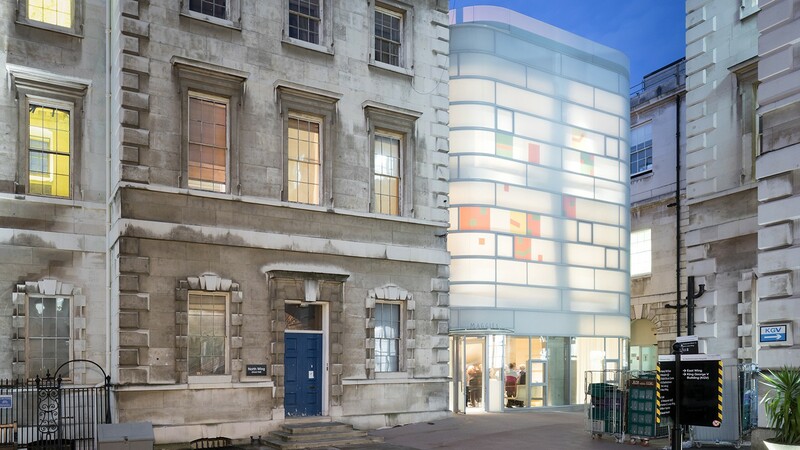 Founded in Smithfield in the 12th century, the hospital is the oldest in London and was founded at the same time as the St Bartholomew the Great Church in 1123. Rahere founded the church and hospital “for the restoration of poor men.” Layers of history characterize this unique site, connecting deeply to the Medieval culture of London. 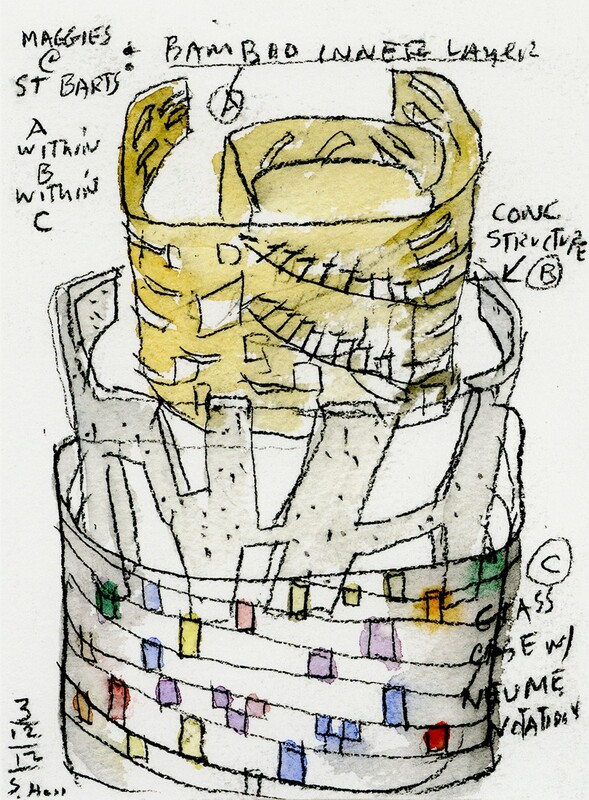 The building was envisioned as a “vessel within a vessel within a vessel.” The structure is a branching concrete frame, the inner layer is perforated bamboo and the outer layer is matte white glass with colored glass fragments recalling “neume notation” of Medieval music of the 13th century. The word neume originates from the Greek pnevma, which means ‘vital force.' It suggests a ‘breath of life’ that fills oneself with inspiration like a stream of air, the blowing of the wind. 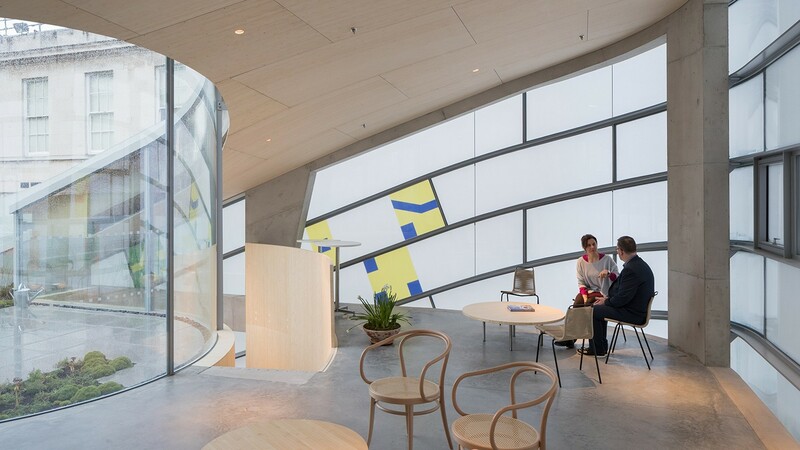 The outer glass layer is organized in horizontal bands like a musical staff while the concrete structure branches like the hand. 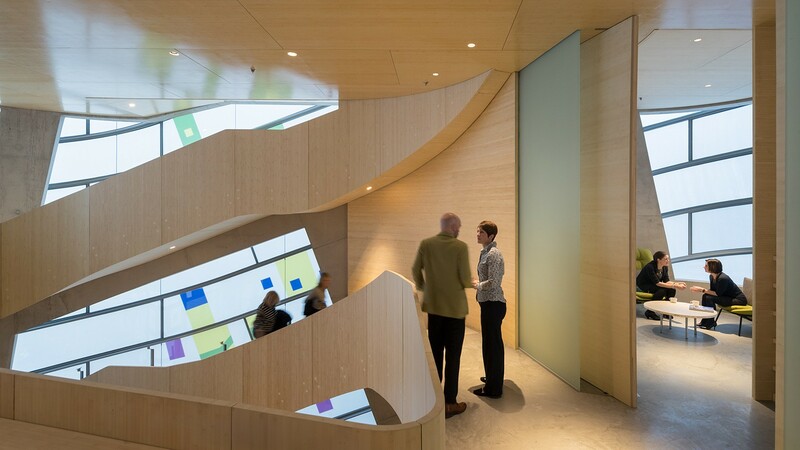 The three story centre has an open curved staircase integral to the concrete frame with open spaces vertically lined in perforated bamboo. 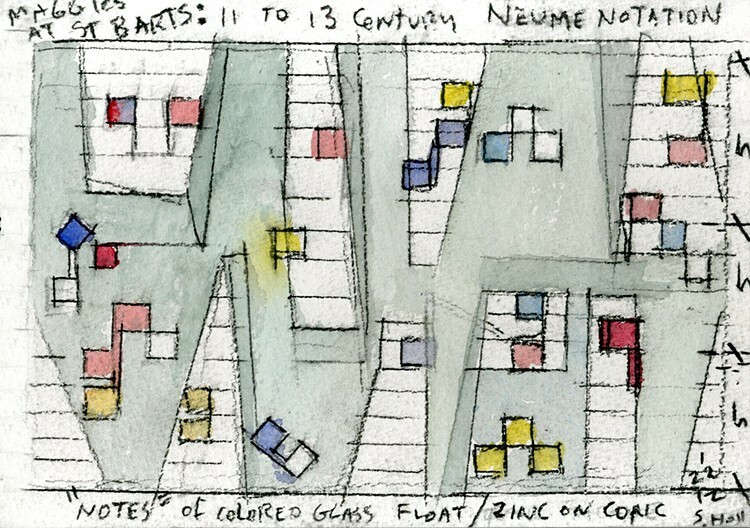 The glass facade geometry, like a musical “staff” is in horizontal strips 90 cm wide, which follow the geometry of the main stair along the north facade, while lifting up with clear glass facing the main square, marking the main front entry. There is a second entry on the west opening to the extended garden of the adjacent church. The building tops out in a public roof garden with flowering trees open to a large room for yoga, Tai Chi, meetings etc. 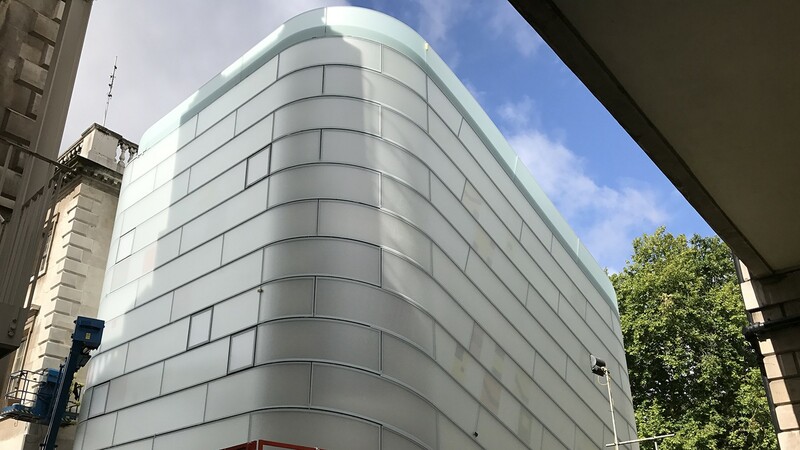 The interior character of this building will be shaped by colored light washing the floors and walls, changing by the time of day and season. 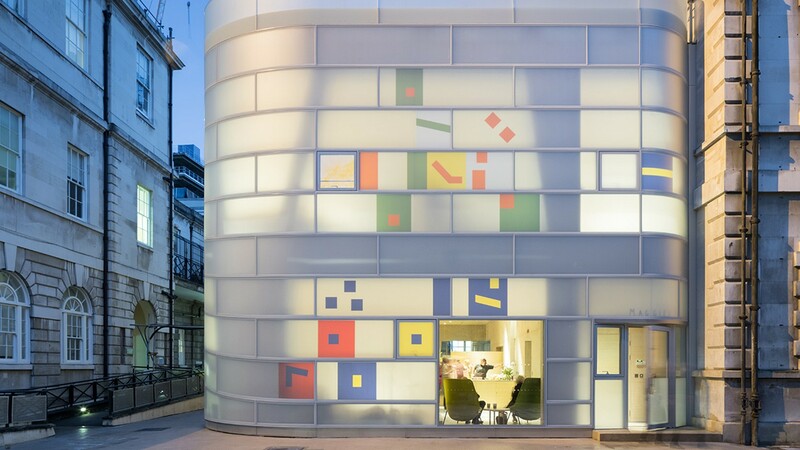 Interior lighting is organized to allow the colored lenses together with the translucent white glass of the facade to present a new, joyful, glowing presence on this corner of the great square of the Barts Hospital. The Maggie’s Podcast is an audio series about what it means to live well with cancer. 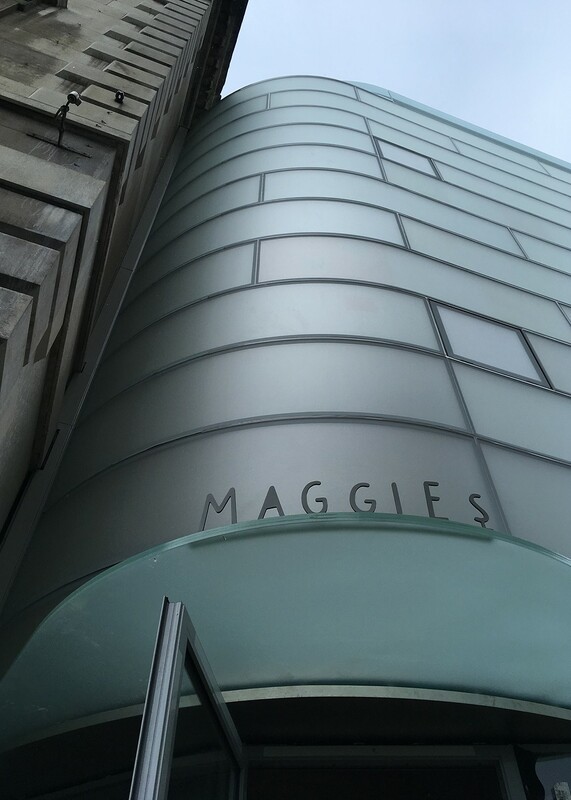 A cast of celebrities, experts and visitors to Maggie’s unique cancer caring Centres will give voice to stories of strength, support and surprise. Listen below or on the Maggie's website.